Dogs with cancer is becoming more and more common. Did you know that, “approximately one in four dogs will develop neoplasia and almost half the dogs over the age 10 will get cancer”, according to the American Veterinary Medical Association. Statistics are staggering for the amount of beings – human and animals – that get cancer. Cancer is something that effects almost everyone at some point in their lives, either personally or via a loved family member, including pets. Keep reading if you or one of your loved ones has already become one of these sad statistics or if you want to help prevent cancer in your pets. Emily & Cajun, our dogs recently diagnosed with cancer. As of recently, cancer has hit on our own home front, not once, but twice within a month; two of our loved dogs have been diagnosed with different forms of cancer. Both are aggressive types of cancer and our team of veterinarians have indicated that chemotherapy and radiation are not good fits for either dog. Therefore, alternatives to keep them comfortable and battle cancer are not just complimentary, they are imperative. We are reminded firsthand how it feels to go through this experience. Even as a holistic animal wellness practitioner that deals with disease, hospice and death regularly, it’s traumatic, devastating and exhausting – both physically and emotionally – to grasp that our loved dogs have cancer. And furthermore, that both cancers will likely take their life. If you too are embarking on this journey, you know exactly what we mean. But know there’s hope. There’s options. There are things you can do right away and over the long term to help keep your loved animal companion comfortable and fight cancer. We know there are several options to help manage our dogs’ conditions and effectively support their quality of life and we’re here to help share those with you. 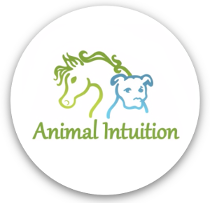 One of the few good things to come of our cancer diagnosis so far is that it has compelled us to write up information about how we, Animal Intuition, have been helping pets affected by cancer over the years through private consultations; offering options for diet, supplements, essential oils, and healing and body work such as massage, and Reiki. As their journey here on Earth starts to wind down, we also offer other integrative options, such as intuitive sessions, that can help provide clarity on next and final steps or closure after your pet has passed away. Of course, throughout the journey, we gift an infinite supply of invaluable emotional support because we understand how much you love your animal companion. With each connection we make, it’s done with love, empathy and care. We work together with you, formulating regimens based on their diagnosis, your resources, short and long term goals and will work with the entire team of professionals helping your pet. So, we began outlining some possible strategies if you’re facing cancer with one of their loved animal companions, be it a cat, dog or horse. 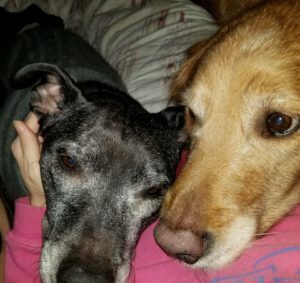 As we continued to compile our thoughts, our notes grew and grew and it quickly became clear that we have way to much information to share in one blog and it just might get confusing referencing information for various species, so we’ve decided to focus our efforts and do a blog series on “Dogs with Cancer”. While we help cats and horses too and even other species, it can be confusing to lump it all together. There are enough differences that we want to provide the information in the most clear way. Our goal is to continue writing and publishing on each topic that we’ve mentioned above to provide you with information that you can use to make the best decisions for your dog and your family. So, stay tuned to our blog for more to come!